You love where you live: the location, the schools, your friends and neighbors…but maybe your home hasn’t reached its potential, needs to be modernized or expanded. We’re here to make your dream remodel a reality. Divine is Boston’s premier design+build firm, offering turn-key remodeling solutions. We provide one-stop design and remodeling services for a stress-free renovation. You’ll work with an award-winning designer who will oversee your entire project from start-to-finish, including all the contractors. And the best part? It will all be done on-time, while you remain in full control of the budget, so that you and your family can get back to enjoying your life, and the gorgeous new rooms within it. Old World charm? Sleek and modern? Classic with a contemporary twist? What style speaks to you when you re-imagine your kitchen? These are just a few of the questions that spark the remodeling process. Do you need more storage space? Or want to open up the kitchen to the rest of the house and create the feeling of a larger floor plan? Is your kitchen simply tired and doesn’t reflect your family’s style? Would a light-filled space make it easier to prepare and share meals with your family? With the design+build process, it’s easier than you think to achieve the kitchen you deserve. Explore some of the kitchens our award-winning team has designed and built for our customers below. Be inspired. Find your style. Be inspired. Find your style. A master bathroom should be a retreat from the outside world, your own in-house spa. This personal space should function efficiently and reflect your unique style. After all, this is where you prepare to face the coming day, and where you unwind at the end of it. Is it time to add a spa tub? A walk-in shower with natural stone tile and multiple jets? Expand the space into an existing closet? Or simply update the fixtures? And if it’s your guest or family bathroom, our designers will create a welcoming and comfortable space that maximizes square footage and makes your guests feel pampered. Plus, small, but frequently used half-bathrooms are a great place to ‘go bold.’ Inspiring bathrooms that feature unexpected design elements set your house apart…all without breaking the bank. We all have a room in our house that could use a refresh. Maybe you purchased your home before you had children and now need a family or play room. Perhaps the laundry room has become a catch-all for your storage needs and threatens to overflow. Or has your master bedroom lost its feeling of “retreat” and needs a refreshing new look? Whether you are planning to renovate your entire home, an addition, or if you require structural work, our award-winning design team will re-imagine your home with you, to ensure that your style always shines through. Houzz is the premier home remodeling web site for homeowners looking for experts in their area. 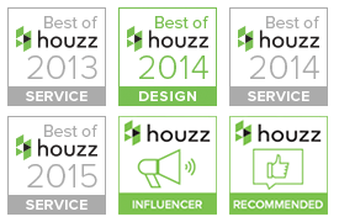 What does it mean to be the “Best of Houzz?” It means that our customers enjoyed their remodeling experience with us so much that they’ve gone out of their way to nominate us for this prestigious award! In fact, Divine’s construction and design team has won numerous awards for creativity, craftsmanship, quality and on-time delivery within a budget.